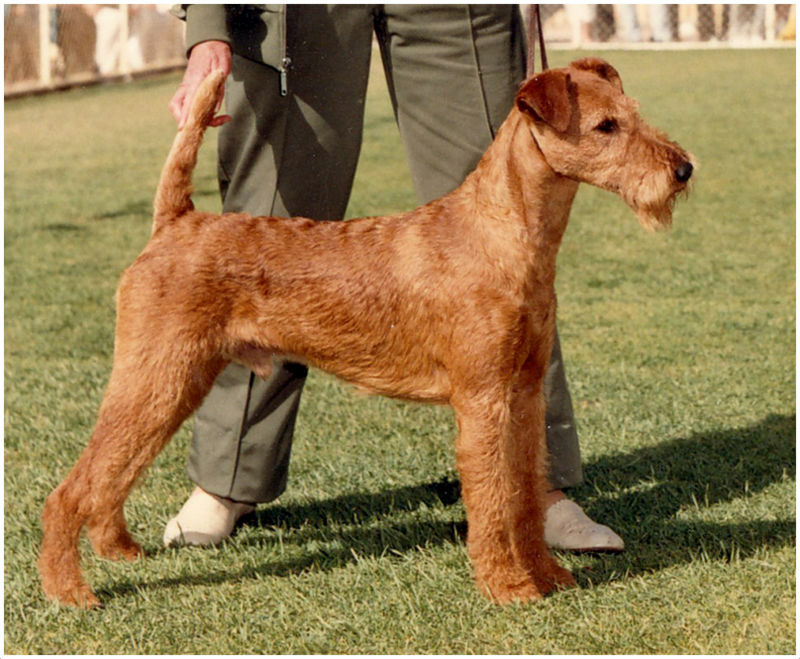 The Irish Terrier is a small-sized terrier dog which is originated in Ireland. The dog suits very well for all the weather conditions and it is likely to be a good pet dog for city as well as rural residents. 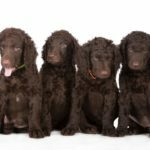 This breed of dogs gained popularity in a short time. 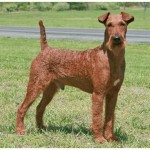 The other name for this dog is Irish Red Terrier. 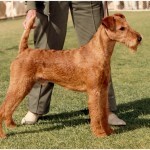 Irish Terrier is said to be one of the oldest terrier breed of dogs. This dog is considered to be red, racy and rectangular. It takes time to make cats as friends. This dog needs time to be friendly with other dogs. It digs the yard for moles and rodents. 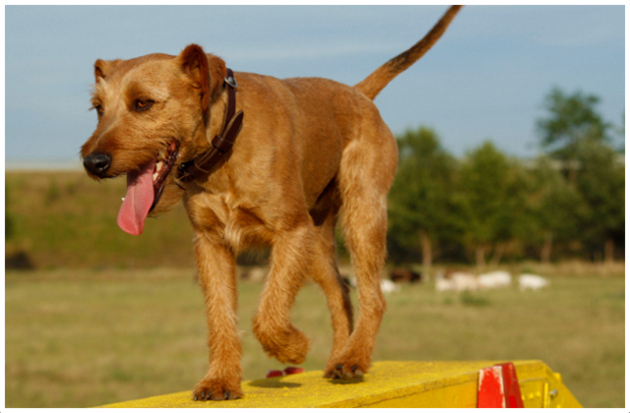 The Irish Terrier dog is hypoallergenic. High effort is not needed to train these dogs as they obey the commands of the owner in a short time. But few owners may find difficulty to train this dog and for them obedience training is recommended. 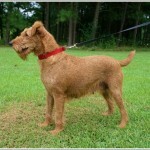 The price of the Irish Terrier puppies is about $500 to $800. The temperament of this dog breed is said to be intelligent, alert and protective. This dog is considered to be the best watchdog with its attentiveness. 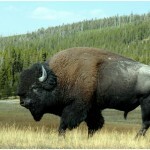 Due to its activeness and alertness it is said to have the abilities of tracking, hunting, guarding, and retrieving. The Irish Terriereven participates actively in dog agility. 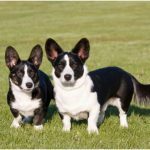 Some Irish Puppies will be black in color when born and slowly it turns to other color. 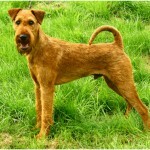 The Irish Terrier is said to be a small and sometimes medium sized terrier dog. 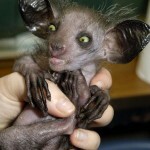 The head of the dog is large and has small eyes which are dark brown in color. The ears of the dog are V-shaped and folded towards the eyes. The muzzle of the dog is bearded and the legs are straight and strong and it has a long tail. The coat of the dog is straight, wiry and hard. It also has an undercoat which is dense. The coat will keep the dog safe from all the weather conditions. 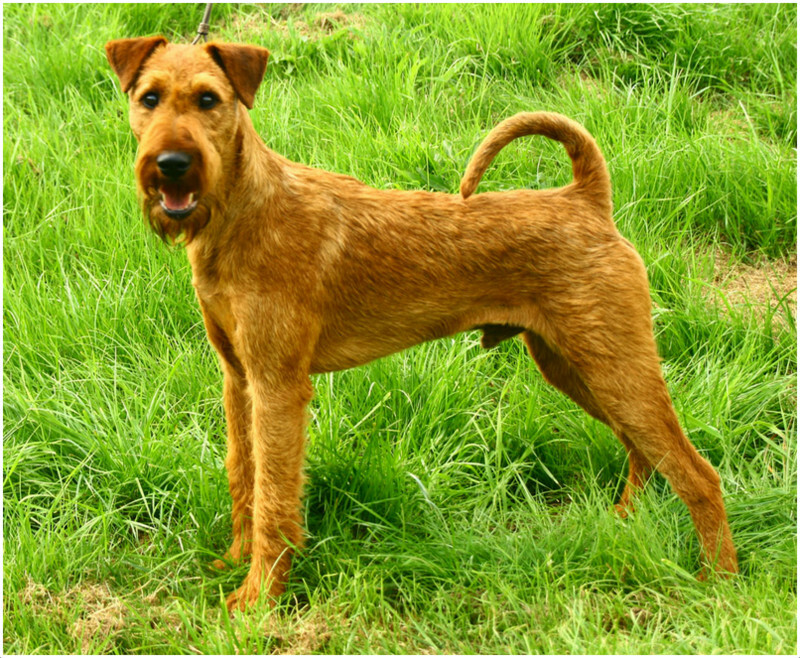 Generally, the Irish Terrier is seen in various colors like red (sometimes bright and sometimes golden), red wheaten or wheaten. The weight of the male dog is about 33 lb (15 kg) and the female weighs about 28 lbs (13 kg). While the average weight for this dog is said to be 25-27 lb (11-12 kg). The height of this dog is about 18 inches (45.72 cm). The Irish Terrierdog is said to be loyal, intelligent, active and protective dog. It is considered as the daring dog but it will listen to their owners up on proper training. It will give good entertainment for the whole family and it becomes a good human companion in a short time. This dog is very active and likes to participate in various dog sports. This dog becomes loyal to the owners within a less time and they are more active indoors rather than the outdoor. These are said to be intelligent dogs due to their tracking scent ability and the dog always keeps itself busy. 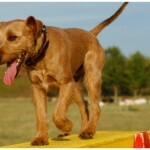 The Irish Terrier dog is generally healthy and doesn’t show any health disorders. But, during the time of 1960s these dogs shown hyperkeratosis (corny pads and severe pain), and as of now they may prone to hypothyroidism and cataracts. No special diet is required for this dog and the owners should prepare a proper food schedule to feed the dog. A high-quality and healthy food is recommended for the dog and use the clean drinking water all the time. 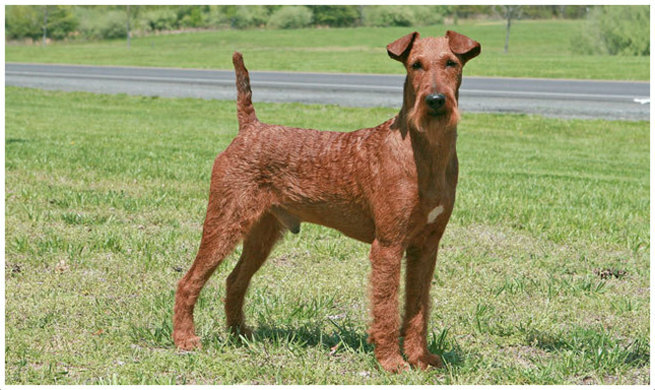 The Irish Terrier will be good enough to live in apartments if the owner can control its bark upon proper training. As this dog seems active indoors rather than outside, it suits for the resident of cities too. The coat of the dog gives required protection to tolerate the weather conditions. A house with the fenced yard will also be suitable for the dog and kids love to play with this dog. 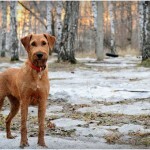 The Irish Terrier needs a regular exercise and a daily walk. It likes to be energetic and active all time, so owner of the dog should take it to daily walks along with moderate exercise. The adult dogs can jog along with the owners. The children love to play with this dog as it is very sportive towards the kids. 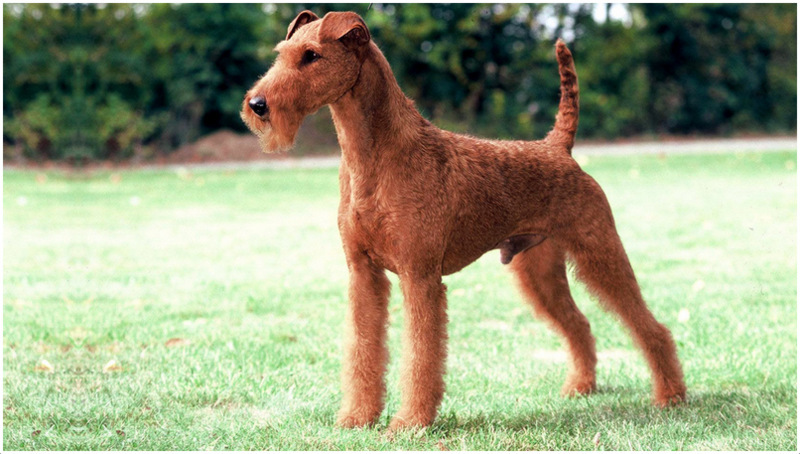 The Irish Terrier dog can give birth to an average of 2 to 5 puppies. The small puppies should be raised with proper care and in case of any emergency it is recommended to consult the vet. This dog will be safe and secure as long as it is under human protection and in a fenced area. The owners should properly supervise the dog when it is on for daily walks as it might grab the attention of the other big animals and may possess the danger. Make sure the dog is not out of your sight and always keep an eye on the dog. 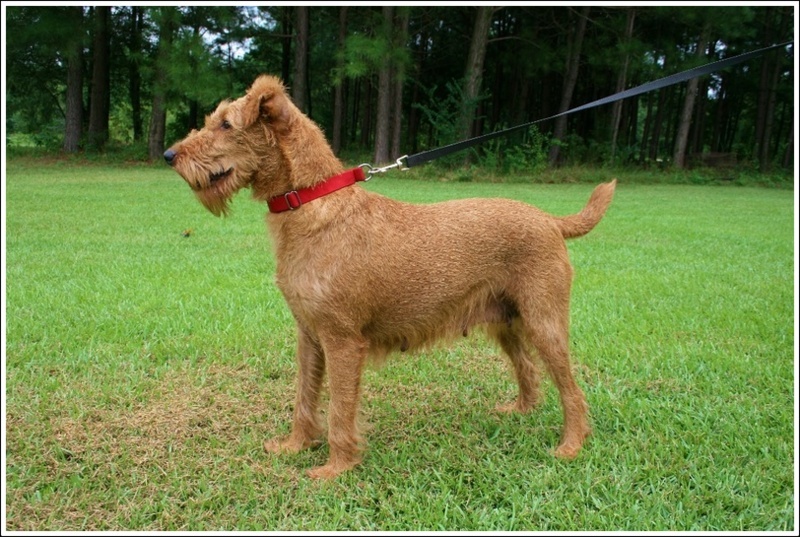 The breeding of Irish Terrier must be done after attaining the proper age. Breeding by professional is advisable so that it can give birth to healthy and fit puppies. 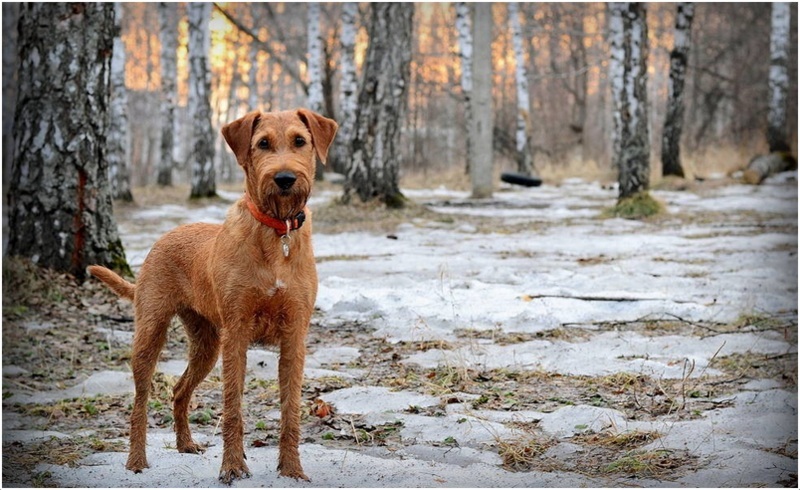 The average lifespan of the Irish Terrier is about 13 to 14 years and some dogs can live up to 15 years provided that it is been raised with proper care and supervision. 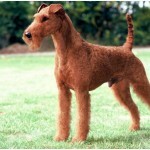 The Irish Terrier should be brushed weekly with a stiff bristle brush. Make it bath whenever necessary and make sure to brush the teeth twice in a week so that the teeth will be free from bacteria. The old and dead hair should be hand plucked once or twice in a year.The nails of the dog should be trimmed every month and the ears should be checked andcleaned regularly. The Irish Terrier is not a heavy shedder as it shed very little. Some Irish Terriers doesn’t shed at all. So, regular grooming is sufficient for the dog so that it can be clean and healthy all the time.